Soul's Fire Designs: Introducing the Incredibly Talented Kaleidoscope Kustoms! Introducing the Incredibly Talented Kaleidoscope Kustoms! Hello everyone! I hope you had a wonderful weekend :). Mine was busy with cleaning, blech. But, my house is somewhat the better for it and that counts for something, right? ;). I am excited to introduce you to another of my favorite Blythe people (and another dear friend!) Miss Sarah of Kaleidoscope Kustoms! The set of pics above are from her latest collection of dollies, all dragon themed! Aren't they amazing?! Sarah has the most wonderful gift with lid art, I don't know HOW she manages to do such incredible detail on something so small! She created the perfect art for my beloved Briony, I don't know how she did it, but with my rather um... lacking direction she gave me exactly what I wanted :D.
Isn't she dreamy? I can't believe all the exquisite details, the waves, the sun's rays, the faces on the bottle.. the message inside... the expression on my gull!!! Incredible! Sarah isn't only talented with carving or painting in miniature, she also has a delightful ability to capture fun or amazing photos. This is one of her latest ones that is such a perfect little scene (and it includes one of my favorite girls of hers, Carly <3 ). Isn't it fabulous? 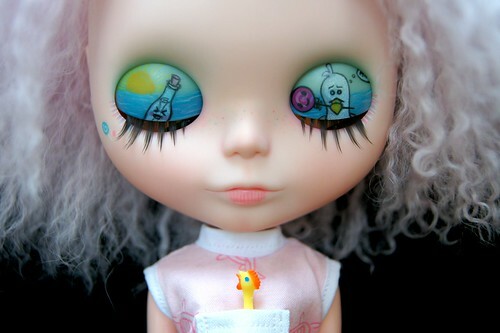 I love how the Blythe world allows such creativity! Not to mention the wonderful sense of community and I have made the most wonderful friends, including Sarah. She has such a beautiful gift and uses it to bring dreams to life. My mom is very artistic and crafty so she has always encouraged me to be creative and to continue my artistic growth. My first big accomplishment was having my logo chosen for our school t-shirts when I was in 3rd grade. I went to college for Graphic Design but never really pursued it after school. I have always loved photography and took classes in both high school and college, so when Blythe came along with the combination of art and photography it was true love! 2) Who is the most inspiring person in your life? Why? My daughter, Ava. Even though she is only 5 (6 in a few weeks) she is amazingly strong and always pushes herself even when she wants to give up. Dave Matthews. I just think he’s completely amazing! I would go have a coffee with him and then ask him to play his guitar and sing to me until he couldn’t sing anymore. LOL! 4) How did you find Blythe? What drew you to her? My mom actually found her on ebay and I was immediately attracted to her quirkiness. It wasn’t until years later after I saw that you could customize them and give them their own personalities that I really got into Blythe. 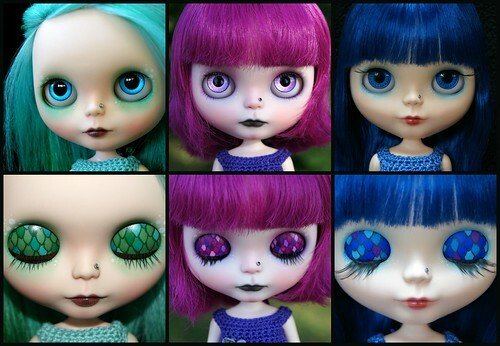 5) Which of your Blythes is your "mini me"? Which is the one you wish you could be? I don’t really have a “mini me” girl. None that look like me at least. I customized about half of the girls that I own so I feel that they have a lot of “me” in them. I sometimes wish that I could be a little punk like my girl Billy. 6) What is the story behind "Kaleidoscope Kustoms"? How did you come up with the name? What is your creative process like? Where do your best ideas come from? After I got my first few girls customized I decided that I wanted to try it myself. I thought it would be easier for me to portray what was in my head if I did it myself rather than trying to explain it to someone else. I have always been strong in my color choices so I wanted to pick a name that had to do with colors. And I liked how Kaleidoscope Kustoms sounded. I do a lot of brainstorming before I start on a girl. I get inspiration from everything around me that I see and hear…art, music, nature, colors, books. Once I have the idea or theme then I will do a “plan” photo where I can see how everything will look together. I only work on one custom at a time so that I can focus completely on what I am doing with that girl from start to finish. After I have my plan done then I will usually split up the work into two days. One day I do all of the prep work (scalp, eyechips, carving, sanding) and the other day I do the color work, eyelid art, assembly and pullrings. I really love to work on the dolls that I can do all of the little details on (eyechips, pulls, charms) because then I feel that they are complete. Lastly I pick an outfit (usually out of our Rag Bag Designs Etsy shop) and photograph them. 7) What five things couldn't you live without? My family (even though they drive me crazy most of the time), internet, my camera, music, and unfortunately coffee. 8) What is the best part about Blythe? About the community? There are so many things I love about Blythe. This hobby has given me so much – a place to get away, a creative outlet, a way to help support my family, amazing friends. The best part of the community is the love and support from the friends I would have never found without Blythe. I seriously get teary eyed when I think about how much this community has done for my family. 9) Anything else you'd like to tell us about you? About your work? I appreciate each and every one of my customers. Thank you for trusting me to create your girls for you! I hope that they bring you as much joy as they do me when I am working on them.